Put two counters on this card. Remove a counter during your upkeep. When you remove the last counter from All Hallow's Eve, all players take all creatures from their graveyards and put them directly into play. Treat these creatures as though they were just summoned. You choose what order they come into play. 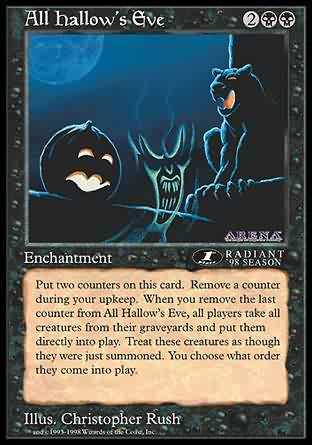 Remove All Hallow's Eve from the game with two scream counters on it. At the beginning of your upkeep, if All Hallow's Eve is removed from the game with a scream counter on it, remove a scream counter from it. If there are no more scream counters on it, put it into your graveyard and each player returns all creature cards from his or her graveyard to play.